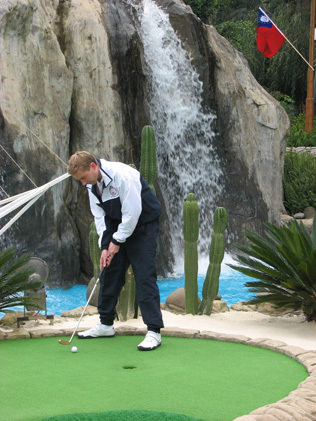 Since 1997, the British Minigolf Association (or BMGA) has been organising a countrywide tour, where anyone can compete against each other on some of the finest mini golf, crazy golf and adventure golf courses to be found in the UK. 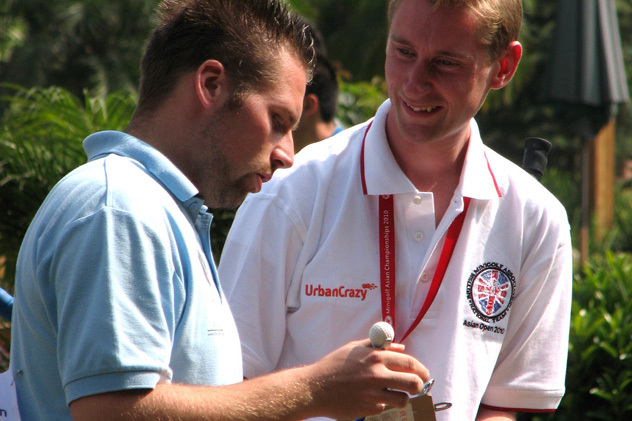 Each year, the tour attracts competitors of all ages and abilities to upwards of 20 tournaments on courses located in places such as Birmingham, London, Hastings, Aberdeen, Stratford-Upon-Avon, Bristol and Norfolk. 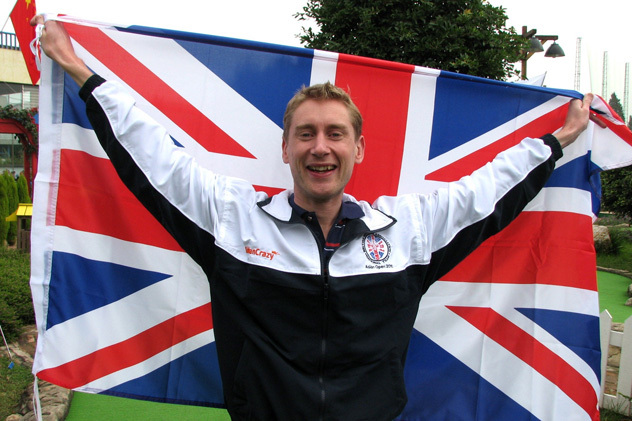 The best players compete for ranking points and prize money (the current UK no1 is Nick Chitty from North London) and for a lucky few, there’s even the chance to play for Great Britain on the international stage! 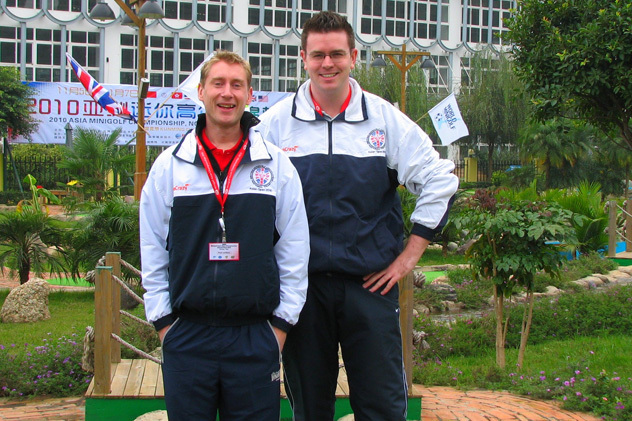 The World Minigolf Federation (the equivalent of FIFA in minigolfing terms) organises international competitions around the world, and earlier this month, Kunming in China was the setting for the eagerly anticipated 2010 Asia Open Minigolf Championships. 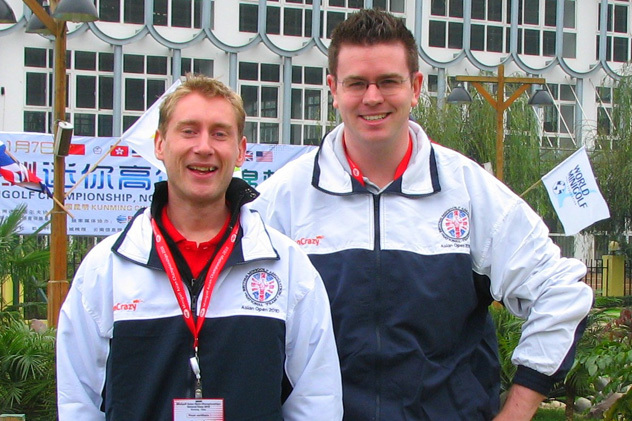 Britons Richard Skeggs and Oliver Florence, both 28 years old, both from Surrey and both playing in only their rookie season on the BMGA tour, were despatched to represent queen and country to compete in what would prove to be a memorable event. 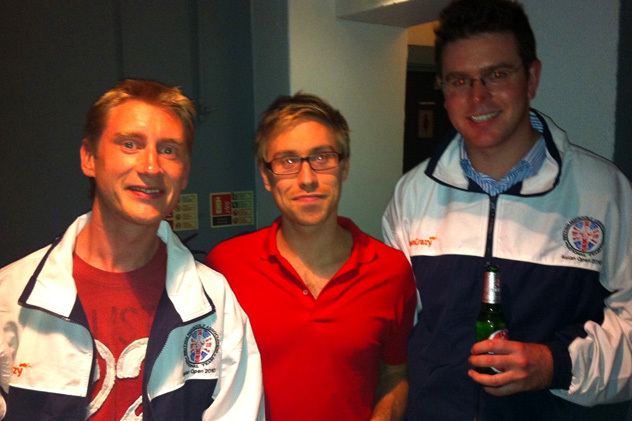 And the boys were kitted out with team clothing supplied by us here at UrbanCrazy! 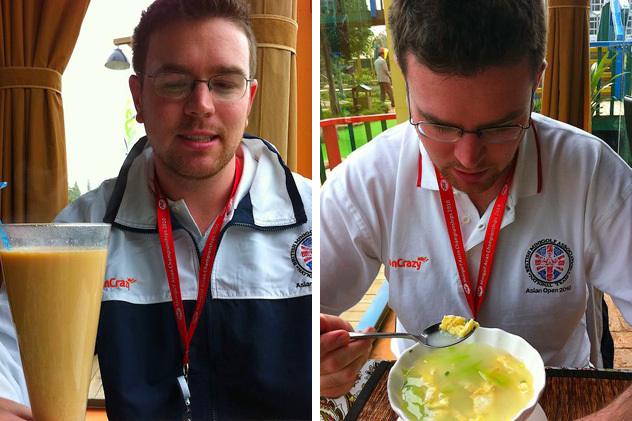 After a 22 hour, 5,000+ mile journey from Gatwick via Bangkok, Rich and Ollie finally arrived at “Hello! 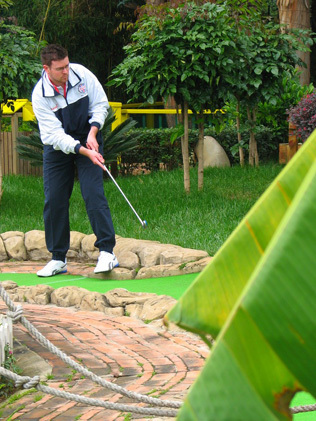 Minigolf Club” in Kunming, only to be met by several press reporters and camera crews all baying for the chance to interview them. They were asked about their chances of success against the other nations taking part, which included Japan, Iran, USA, Taiwan, Germany and China amongst others, and it very soon became obvious to our players that they would be up against some very talented and significantly more experienced opposition from around the globe. After a couple of days practise the 3-day, 12-round competition got underway on Friday 5 November; the nervous duo not knowing quite what to expect. But at the end of day 1, Ollie found himself lying in mid-table, a very respectable position considering the quality of the field. 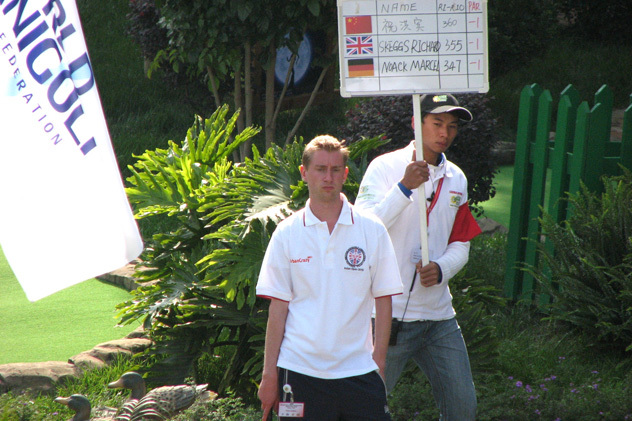 However, it was Rich who surprised everyone, including even himself, by posting a 1-under par score to end the day in a lofty 3rd place behind leader Marcel Noack of Germany and China’s Zhuhongbin! For the followers of their informative blog here in the UK and abroad, the fact Rich was in with a chance of a medal made for exciting and tantalising reading. But to go on and achieve such a remarkable feat would require extraordinary composure and nerves of steel over the next 144 holes. Luckily, Richard, a commercial pilot by trade, possesses those qualities in oodles, and after two further days’ play was able to climb another place to win the silver medal in the men’s category, with Ollie finishing a creditable 14th. The undeposable Noack took the gold posting an overall score of 419, with Zhuhongbin slipping down a place to take the bronze. 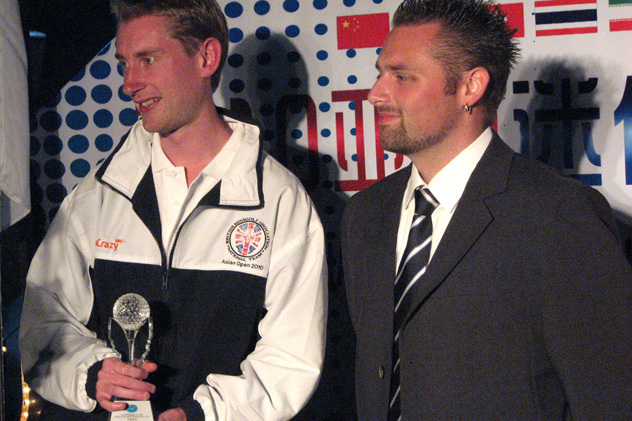 It was an excellent achievement for both players, especially Rich who proudly paraded his trophy for the cameras at the closing ceremony. 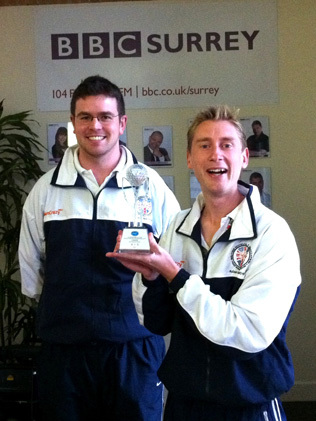 Their return to the UK last week was no less exciting with even more media attention from BBC Radio Surrey and a hilarious appearance on “Russell Howard’s Good News”, aired on BBC3 last night. For photos from Ollie and Rich’s trip click on the large photo (top right) to open the gallery. 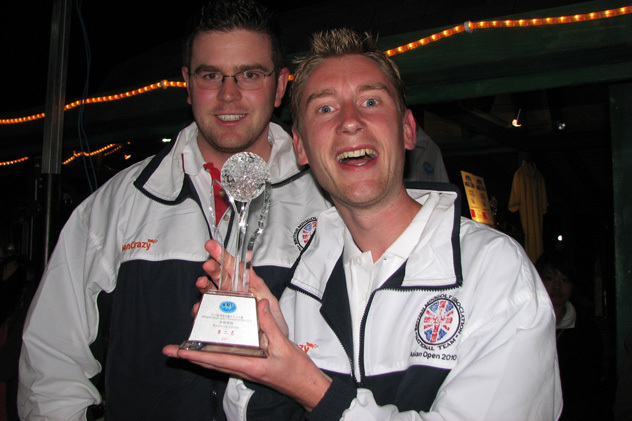 And to learn more about the British Minigolf Association’s “Magical Minigolf Tour” visit www.minigolf.org.uk. 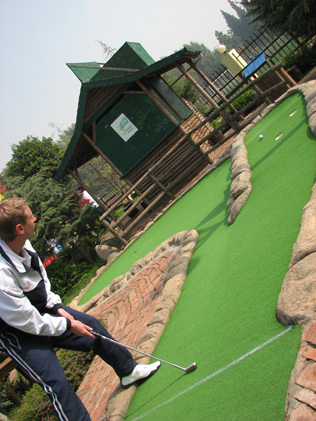 It really will open your eyes to a whole new world, and who knows, maybe you could become the next mini-golf hero!